It is irrefutably true that artists are no less subject than any other men to John Donne’s oft-quoted assertion that ‘no man is an island,’ but plentiful are the opportunities for drowning in the tumultuous seas that separate creative geniuses from the nearest neighboring shores. Fond as modern society is of attaching labels to every possible entity, a sobriquet like ‘the Czech Mozart’ is as damaging as it is flattering to the modern reputation of the Eighteenth-Century composer Josef Mysliveček, heightening interest but also suggesting a discernible element of conventionality. In a sense, promoting Franco Faccio’s Shakespeare-derived opera Amleto as the ‘missing link between Verdi and verismo’ places this forsaken score in a context that emphasizes its significance in the evolution of Italian opera in the Nineteenth Century but undermines its merits as a destination in its own right. With a libretto by Arrigo Boito, the composer of the still-under-appreciated Mefistofele and Nerone whose libretti for Verdi’s Otello and Falstaff qualify him for the title of Italy’s most gifted operatic adaptor of Shakespeare, Amleto first recreated something rotten in Denmark on the stage of Genoa’s Teatro Carlo Felice on 30 May 1865, with Mario Tiberini, Verdi’s first Don Alvaro in the revised version of La forza del destino that continues to be preferred today, in the title rôle. Neither a rousing success nor the dismal failure that its subsequent neglect might suggest it to have been, Amleto can be said to have suffered a variation of the fate endured by its protagonist: misrepresented, misunderstood, ignored, and dismissed, Faccio’s most accomplished score now seeks in today’s reappraisal the retribution that it deserves. Born in Verona in 1840, two months before Tchaikovsky was born four thousand kilometers away in today’s Udmurt Republic, Francesco Antonio Faccio honed his gifts at the Milan Conservatory, where his studies brought him into contact with Boito. The friendship that developed between them was both productive and potentially injurious: their barbed and very public criticism of the Italian musical establishment earned them the ire of Verdi, the undisputed sovereign of that establishment. Fortunately for Faccio, Verdi was capable of graciousness and seeing talent despite triviality, eventually facilitating the younger man’s appointment as conductor at Teatro alla Scala and advocating for Faccio’s conducting of the first performances and momentous productions of Verdi’s own later operas. Faccio was only twenty-five years old when Amleto was premièred in Genoa and not yet thirty-one when his revision of the score was first heard at La Scala in 1871. Though Faccio was to live for another two decades [ironically, Verdi, bastion of the ‘old guard’ against which Faccio and Boito railed, outlived his younger Veronese colleague by ten years], this is where Amleto’s journey stalled until the Twenty-First Century. Dramatically, Boito’s libretto for Amleto is in no way inferior to his Shakespeare libretti for Verdi. Musically, Faccio’s score is the equal or superior of many of the pieces that have been resurrected in recent years, including Filippo Marchetti’s Ruy Blas, the title rôle in which was created in 1869 by the first Amleto, Mario Tiberini. Faccio’s mastery of orchestration is sometimes more striking than his skill as a melodist, but Amleto is a work that profusely rewards the listener’s curiosity. 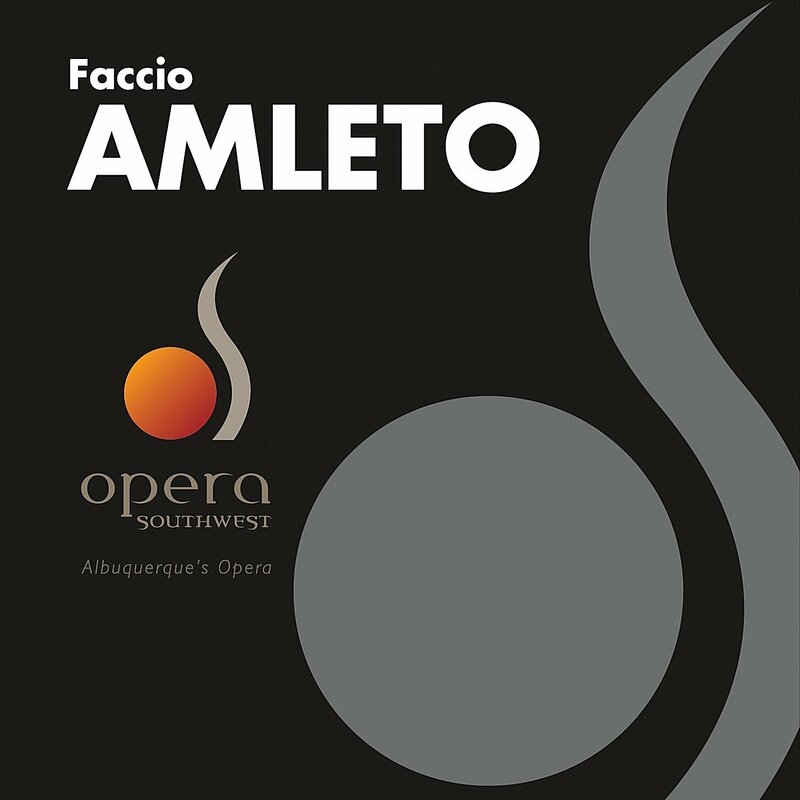 Recorded during critically-acclaimed performances at Albuquerque’s Opera Southwest, this release provides Amleto and its creator with a substantial measure of the vengeance to which the opera’s neglect entitles them. Like Shakespeare’s play, which is gripping when read but can be overwhelming in performance, it is apparent that Faccio’s opera is better suited to the stage than to the studio. Even at their most bountiful, noises from stage and audience in this recording are not bothersome, the extraneous sounds contributing to the performance’s palpable atmosphere—a trait invaluable to both Hamlet and Amleto. Also crucial in the creation of the atmosphere that the opera needs are the efforts of the Opera Southwest Chorus and Orchestra. The orchestra’s playing luxuriates in the richness of Faccio’s part writing, the few mistakes that remind the listener that this recording documents live performances indicating the difficulty of the music. Orchestral textures are for the most part ideal, and balance of ensemble is thoughtfully managed, especially in the grand public scenes. Faccio’s choral writing prefigures passages that Verdi would create in Act Two of Aida and the opening scene of Otello, and the choral singing in this performance is one of Opera Southwest’s foremost achievements. The choristers consistently deliver energetic accounts of their music, often giving the performance the dramatic force of Greek tragedy, and their efforts are unerringly musical. With this recording, Opera Southwest’s personnel provide further evidence of the fantastic work being done by America’s regional opera companies, work often superior to the efforts of larger companies in and beyond the United States. That resurrecting Amleto was not merely a project but a personal crusade for composer and conductor Anthony Barrese is audible in every second of this recording. Having prepared the critical edition of Faccio’s score, now receiving attention throughout the world, he conducts the performance on these discs as though his life, as well as the opera’s fortunes, depended on it. In Barrese’s hands, an electric ambience is engendered via the opera’s opening pages that permeates the performance, the dramatic tension maintained until the final chord of Faccio’s score. Musical gestures are always at the service of the narrative, the conductor facilitating a reading in which the climaxes of every scene are fully realized but organically fused within the opera’s overall structure. The chosen tempi keep the opera moving without pushing any of the performers on stage or in the pit beyond the limits of comfort or good taste. Unlike the endeavors of many proponents for overlooked repertory, Barrese’s pacing of Amleto does not attempt to force the listener to accept the opera as a rediscovered masterpiece: rather, Faccio’s music is performed with equal measures of passion and precision, and the listener is invited to draw his own conclusions. It is impossible to know how Mendelssohn’s conducting of the Bach Passions sounded, but, as it was guided by the affections of rediscovery and dauntless advocacy, it can be surmised that, in spirit, it must have resembled Barrese’s conducting of Amleto. Heard as both the Araldo and Il Re Gonzaga, tenor Jonathan Charles Tay exemplifies the meticulous casting that was enacted in filling the roster for Opera Southwest’s production with singers qualified to make the most positive of impressions with their handling of Faccio’s music. In the second part of Act Two, Tay sings ‘Vieni, compagna, un tiepido orezzo verspertin fa carolar le mammole nel placido giardin’ with total immersion in the drama, the singer’s vocal colorations reflecting the subtleties of the text. Similarly, tenor Javier González injects a rigid spine into Laerte, a figure too often inert in performances of Hamlet, voicing ‘Sovra il desco inebriato piovan canti, incenso e fiori’ in Act One with steady tone and sure dramatic instincts. These gentlemen’s performances are complemented by the strong, sonorous vocalism of bass Matthew Curran as the Primo Becchino and Polonio. In the latter rôle, this imaginative singer is a credible father to González’s Laerte and the fragile Ofelia, even his most pompous political passages softened by paternal tenderness. The insightful wisdom of his ‘To thine own self be true’ speech notwithstanding, the loss when Shakespeare’s Hamlet erroneously slays Polonius is rarely deeply felt, but Curran makes the character truly amusing in his self-importance and genuinely sympathetic in his vestiges of humanity, not least by sculpting ‘Quand’ei qui giunga, a lui verrà mia figlia’ in Act Two with dignity and distinguished tone. One of the most fascinating aspects of Amleto is the manner in which Faccio endowed characters that function in Shakespeare as little more than stock figures who set the moods of scenes or advance literary conceits with innovative, interesting, and skillfully-written music. It is therefore strange to observe how comparatively few opportunities for musical expression Faccio provided for Orazio, Shakespeare’s Horatio and one of Hamlet’s most consequential figures. [In the First Folio edition of Hamlet, Horatio speaks 292 lines, fewer than several characters but 122 more than Ophelia!] In this performance of Amleto, bass Joseph Hubbard grants Orazio the stature of his Shakespearean counterpart. Singing with imperturbable concentration, Hubbard precisely gauges the gravity of each note and word of his part, attaining the difficult balance between urgency and levity. Faccio’s Orazio is basically a conventional operatic secondo uomo, but Hubbard’s Orazio is a man with his own identity, in Amleto’s service but never in his shadow. Bass Jeffrey Beruan is a singer whose performances often inspire that most frustrating of operatic questions: why are so many companies casting less-qualified vocalists for appropriate rôles when an artist of Beruan’s caliber is available? Interpreting Luciano and the pivotal part of Lo Spettro in this performance of Amleto, the bass exhibits his considerable strengths in singing of thrilling impact. In the second part of Act One, Beruan’s articulation of the ghost’s ‘Tu dêi saper ch’io son l’anima lesa del morto padre tuo’ is chilling, the effect on the listener as great as that on Amleto. Equally potent is his voicing of ‘Ma intorno io sento come un olir di soffio mattutino,’ his enunciation of text as imposing as his musical prowess. ‘Figliuol, dal cieco furiar rimanti’ in Act Three is conveyed with galvanizing conviction. In certain passages, the range of the ghost’s music challenges Beruan, taking him into territories both above and below the stave in which intonational security momentarily falters. Occasionally, too, the singer’s declamation is slightly more emphatic than the music necessitates, and the raw force expended takes a toll on tonal quality. Still, Beruan’s performance is shaped by an earnest response to the score, and he haunts this Amleto with artistry of a high order. The villainous Claudius is the point at which all of Hamlet subplots intersect. Guilty of both fratricide and regicide, in addition to having married his murdered brother’s wife, Claudius is the quarry of Hamlet’s messy, meandering quest for revenge. Portrayed by baritone Shannon De Vine, Faccio’s and Boito’s Claudio is an usurper who is both conniving and cowardly, not the equal of Verdi’s and Boito’s Iago but a plausible catalyst for Amleto’s neuroses. In Act One, De Vine assumes an imperious stance in ‘Di giulivi clamori sorga un tuon per le splendide sale,’ the baritone cloaking the character’s treachery in smooth vocal acting. The baritone sings ‘Libiam! La lagrima sul ciglio spunti’ with bravado, manifesting a sweeping contrast with the burgeoning nervousness that grips Claudio during the play within a play in Act Two. The near-manic sentiments of ‘O nera colpa! Orribilmente inflitta entro l’occhio dell’anima!’ in the first part of Act Three are imparted by De Vine with resonant certitude. De Vine’s reading of ‘S’empian le coppe di prezioso vino’ in the second part of Act Four trembles with the conflicting emotions of a man who senses that the game is up. Dramatically, De Vine is a Claudio worthy of the Globe: musically, he speaks Faccio’s musical language with compelling fluency. In Ambroise Thomas’s operatic incarnation of Hamlet, it is the titular prince’s mother Gertrude who claims much of the best music, particularly in her duets with Claudius and Hamlet and the arioso ‘Dans sons regards plus sombre.’ Faccio’s Geltrude enjoys a similar caliber of music, and she receives from soprano Caroline Worra a portrayal of visceral immediacy apt for the character and musical poise befitting a queen. To the mother’s tense dealings with her son and the wife’s increasingly troubled discourses with her husband Worra brings emotional directness and singing of white-hot charisma. In the scene with Claudio and Polonio in the first part of Act Three, the soprano excels as a mistress of dramatic utterance allied with undeviating adherence to exalted musical values. Worra’s voicing of ‘Ah! che alfine all’empio scherno mi ribello, o snaturato!’ reverberates with feeling. The singer’s easy command of the tessitura of Geltrude’s music is wonderful, and the scope of Worra’s artistry is revealed by the extent to which she exerts a prodigious histrionic presence even in the context of an audio recording. Ophelia is among the Bard’s most one-dimensional heroines, her function in Hamlet being largely that of a witness to other characters’ machinations. Great actresses have managed to make her more than a static figure who strikes poses akin to Sir John Everett Millais’s famous depiction of the drowned Ophelia, but, whether the score before her bears the name of Faccio or Thomas upon its cover, the soprano portraying Ophelia faces a problematic task when seeking to infuse the character with anything resembling unaffected verisimilitude. From the first notes of her entrance music, soprano Abla Lynn Hamza strives admirably to create an engaging Ofelia, phrasing the lovely ‘Dubita pur che brillino degl’astri le carole’ artfully and rising to the fortissimo top C with assurance. In Act Two, Hamza’s account of ‘Signor, da gran tempo - tenevo nel cor di rendervi questa - memoria d’amor’ exudes femininity, but this is no shrinking-violet Ofelia: rather than being lost in the character’s delicacy, this soprano embraces it, making it an integral but not the defining element of her interpretation. Unsurprisingly, the pinnacle of Faccio’s writing for Ofelia is her mad scene in the second part of Act Three. Here, Hamza’s thoughtfulness produces a traversal of ‘La bara involta d’un drappo nero move alla volta del cimitero’ that transcends oft-parodied operatic insanity. Hamza’s Ofelia persuasively and movingly relinquishes her grip on rationality, but the singer’s grasp on the music remains firm. When this Ofelia sings ‘Ahimè! chi piange? è il salice, che piange, e piange tanto che l’acqua del suo pianto formò questo ruscel,’ she seems to have already entered a state beyond mortality. Hamza’s technique meets the strenuous demands of Faccio’s music without resorting to trickery, and her vocal confidence markedly enhances her kaleidoscopic portrait of Ofelia. The title rôle in Hamlet is among the greatest creations in theatre and literature, the tormented Danish prince having captivated audiences throughout the world in an extraordinary array of portrayals in different styles, methods, and languages. On stage and screen, he has been hearty and handsome, narcissistic and near-demented, idealistic and idiosyncratic, and, as brought to life in Opera Southwest’s production of Faccio’s Amleto by tenor Alex Richardson, he is awkward and disenfranchised, an adolescent catapulted into adulthood by events with which he seems scantily equipped to cope. That he is fully cognizant of his uncle’s misdeed and his mother’s complicity is never in question, and the evolution of Richardson’s Amleto is guided by his journey from brooding indignation to unhesitant brutality. That transformation is initiated in Act One with the tenor’s agitated statememt of ‘Ah si dissolva quest’abbietta forma di duolo e colpe! si dissolva in nulla.’ He reveals a wholly different facet of Amleto’s psyche with his reverent but robust ‘Gran Dio!... misericordia!... Vegliate su di me, santi del cielo!’ in the opening act’s second part. The ambivalence of Amleto’s monologue ‘Essere! o non essere!’—the equivalent of Shakespeare’s ‘To be or not to be’—is heightened by a restless cello obbligato and shifting tempi, but Richardson’s verbal fluidity and solid top A and B♭ confirm that this Amleto’s resolve is ‘to be.’ There is stinging irony in his singing of ‘Fatti monachella. Sì fatti monachella,’ and in the second part of Act Two the tenor’s performance misses none of the pointed meaning of ‘Osserva, Orazio, su quella fronte non vedi un funebre strano pallor?’ In Amleto’s scene with his mother, uncle, and Polonio in the first part of Act Three, it is obvious that the desire for vengeance has become an all-consuming obsession in which distinctions of right and wrong and good and evil are obscured. Richardson sings ‘Che rubi e insudici troni e corone’ powerfully, followed by an account of ‘Celesti spirti! O lugubre spettro del padre morto’ in which the singer’s voice is as resilient as the character’s mind is anguished. Another of Hamlet’s most familiar scenes is that in which the prince ponders the transience of life whilst the gravediggers go about their work, and Richardson phrases ‘Ahimè! Povero Yorick! Me ’l rammento io pure’ in Faccio’s setting with an abiding aura of poetic wonder. Richardson’s vocalism is at its most refined in the opera’s final scene, but he is an Amleto who is more rugged than cerebral, one who actively rejoices in the pursuit of retaliation for his father’s murder. Like Alvaro in Verdi’s La forza del destino, Faccio’s Amleto needs both force and finesse, and Richardson, here an expressive but never ‘soft’ singer, approaches the rôle with commendable straightforwardness, avoiding the trap of over-acting. Faccio’s music wages war against the tenor’s upper register, but Richardson never surrenders, conquering the composer’s writing with corpuscular sturdiness that recalls Giacomo Lauri-Volpi. Though greater expressive nuance and dynamic shading would be welcome, Richardson genuinely sings music that many tenors would likely be inclined to shout, and he is a bold, heroic Amleto.